Adding in autumn to our home is typically a quiet affair. I like little touches here and there, but for the most part I tend to stay on the neutral side of things. And sparingly at that. But this year, however, I went a little wild. OK, not too wild… well maybe. See, it all started when my husband and I went to lunch. Our favorite Mexican place (basically the only place we ever eat) has 2-for-1 margaritas Monday-Thursday. And since it was a Tuesday, then I had two. Because… margaritas are my weakness. Then, around half way through the second drink, I had the grand idea to stop by the produce market for pumpkins. And I bought pumpkins. 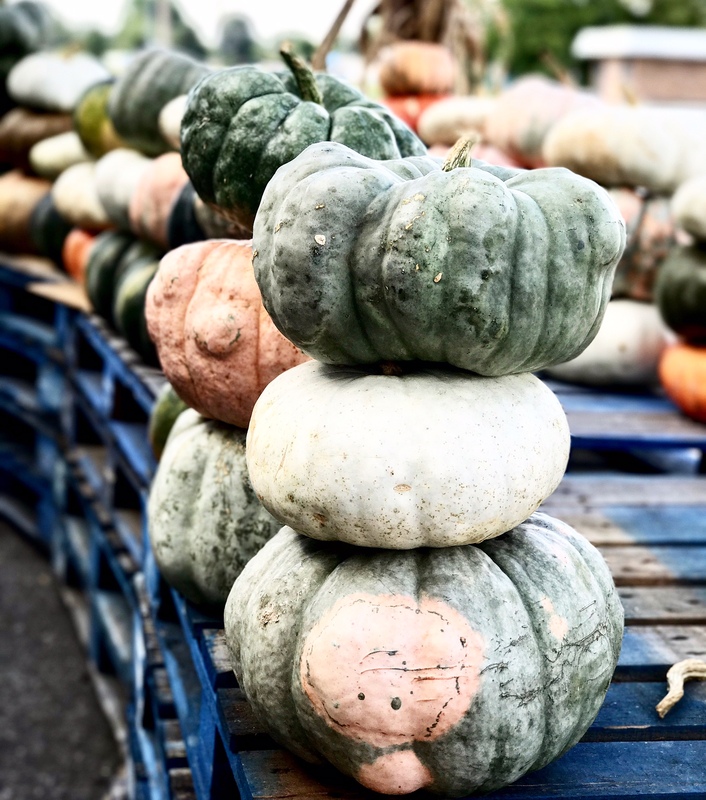 Lots and lots of pumpkins. So many, in fact, that it took two buggies to haul them all. 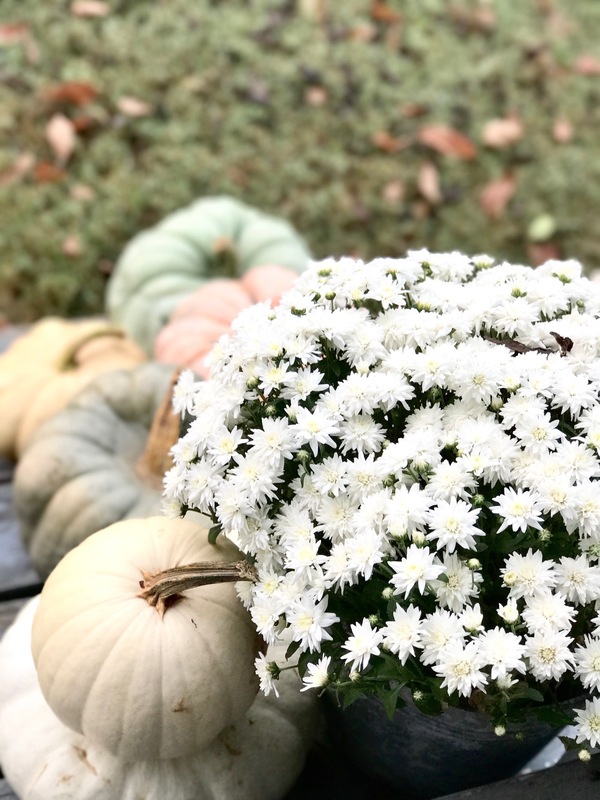 Along with a few mums. Big & small. White mums are the best, right? You get the brightness of white summer flowers in autumn’s favorite flower. 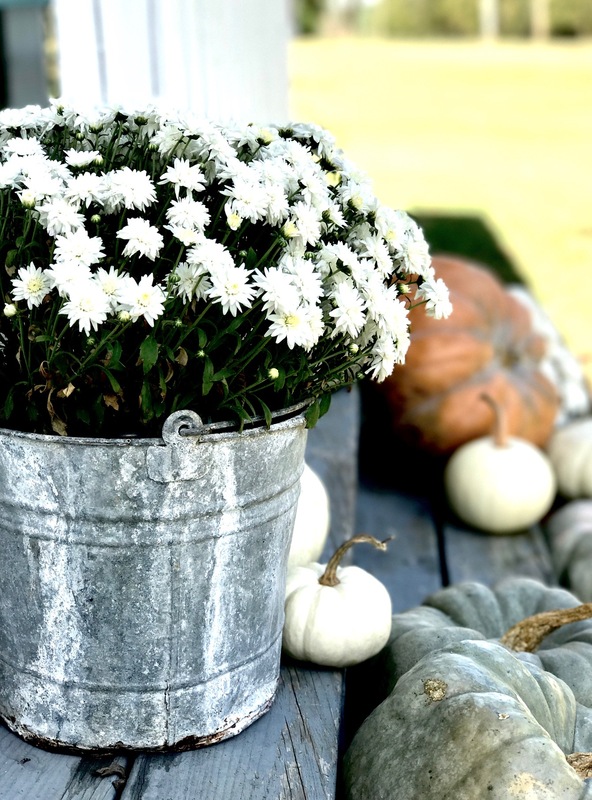 Of course, those pumpkins & mums always look better in buckets – so I dug out all of my beloved vintage buckets & plopped them inside. Without rhyme or reason, I put the pumpkins all around and called it done. Because the last thing I want to do is stress over keeping something simple. With no goals of perfection, I didn’t sweep off steps or pull the random weeds. I just embraced it. 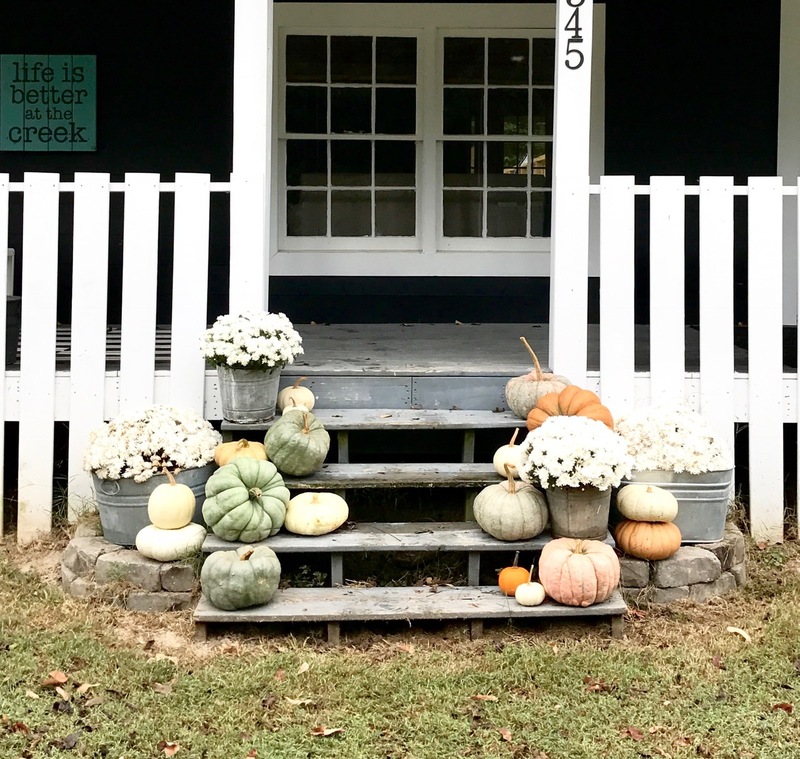 Love your decorations on your porch…uncomplicated, but pretty!!! Really like the green pumpkins. Love it! I love the soft colors of the pumpkins against the grey steps. Very nice. Happy Fall to ya, and blessings abundant. 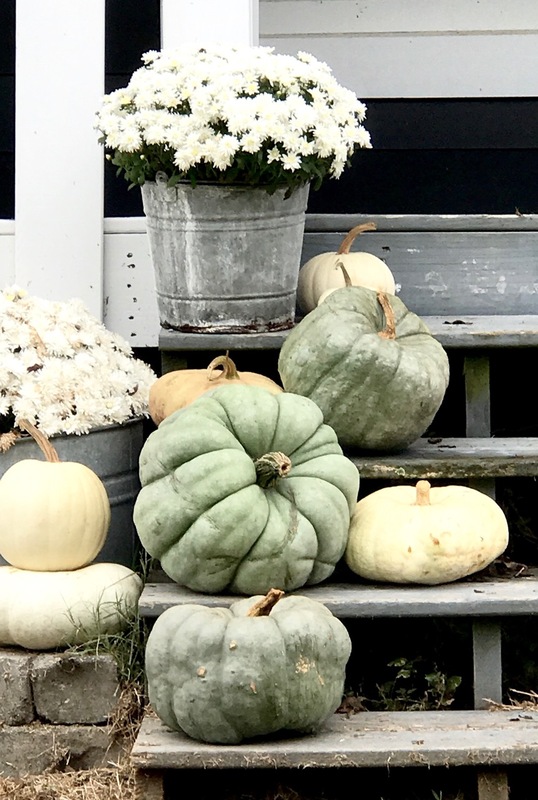 Oh my goodness, your porch is adorable and I love those chunky pumpkins. I just found you and already adore you. You know one (of many) things I love about you Ms. Gina? It’s that you embrace it and don’t pull the weeds and sweep the steps! You’re just like me! Although I’m a super new blogger and have been told that it’s bad not to have perfect pictures I can feel like a real person with you and your blog. Big hugs! Love all your pumpkins! So cute on the porch steps! And by the way Gina, margaritas are my weakness too!! 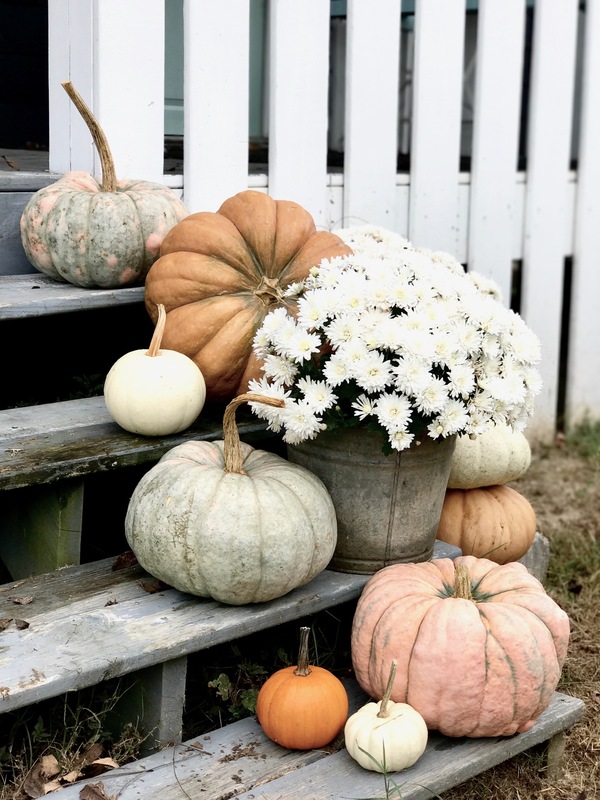 I look forward to Fall every year, just so that I can decorate my porch with pumpkins and fall flowers. Thanks for sharing this, I am enjoying you blog very much. I like the way you think girl! Margaritas & pumpkins……who knew? I always adore your décor. You are absolutely amazing at what you do. My question is how did you paint the pumpkins. They look rustic but yet shabby chic. Thank you and always looking forward to your next project.